In the past decade there has been a resurgence of interest in the clinical use of inert gases. In the present paper we review the use of inert gases as anesthetics and neuroprotectants, with particular attention to the clinical use of xenon. We discuss recent advances in understanding the molecular pharmacology of xenon and we highlight specific pharmacological targets that may mediate its actions as an anesthetic and neuroprotectant. We summarize recent in vitro and in vivo studies on the actions of helium and the other inert gases, and discuss their potential to be used as neuroprotective agents. The inert or noble gases helium, neon, argon, krypton and xenon exist as monatomic gases with low chemical reactivity. Considerable attention has focused on the use of xenon as a general anesthetic [1–4] and its potential for use as a neuroprotectant [5–7]. A number of recent studies report that helium may have neuroprotectant and/or cardioprotecant properties [8–13]. Argon also appears to be neuroprotective in certain in vitro and in vivo models [14, 15]. At first sight it might appear unlikely that inert gases would have any biological activity. Nevertheless, evidence for the biological effects of inert gases emerged from research into the physiological effects of diving. As long ago as the 1930 s, nitrogen was shown to be the cause of the narcosis experienced by divers [16, 17]. The narcotic effects of nitrogen begin to occur at a depth of about 30 meters (a pressure of ~3 atm), and increased with depth, with loss of consciousness occurring at depths of about 100 meters [18, 19]. Behnke and Yarbrough showed in 1938 that if helium replaced nitrogen in the breathing mixture, the nitrogen narcosis was avoided . Neon is also devoid of narcotic effect . The lighter inert gases helium and neon therefore appear both chemically and biologically inactive, at least at tolerable pressures (see below). Argon and krypton, on the other hand, induce narcosis more potently than nitrogen [17, 21] - with the pressures resulting in anesthesia being 15.2 atm and 4.5 atm, respectively . These heavier inert gases therefore do have biological activity, at least under hyperbaric conditions. Xenon was predicted to be an anesthetic at atmospheric pressure, based on its relative solubility in fat compared with argon, krypton and nitrogen. An effect of xenon in animals was first shown by Lawrence and colleagues in 1946, who reported sedation, ataxia and other behavioral effects in mice exposed to between 0.40 and 0.78 atm xenon . The anesthetic potency of inert gases follows the Meyer-Overton correlation with solubility in oil or fat (see Figure 1 and Table 1), with xenon being most potent (and most soluble in oil) followed by krypton and argon. Radon is the heaviest of the inert gases and might be predicted to be an anesthetic. Radon is radioactive, however, and exposure to radon - even at very low levels - is a health risk . Partition coefficients are experimentally measured Bunsen coefficients. Anesthetic potency data for nitrogen, argon and krypton are for loss of righting reflex in mice. For xenon, values are given for loss of righting reflex in mice and general anesthesia minimum alveolar concentration in humans (see text for minimum alveolar concentration values). Data compiled from the following sources: aCRC Handbook of Chemistry & Physics . bSelovar . cTrudell and colleagues . dRoth and Miller . Meyer-Overton correlation for the inert gases and nitrogen. Values of the Bunsen oil/gas partition coefficient and the pressures for loss of righting reflex in mice are taken from Table 1. The line shown is a least-squares regression of the data shown in the filled symbols. The points shown for neon and helium (open symbols) are theoretical predictions based on their oil/gas partition coefficients. 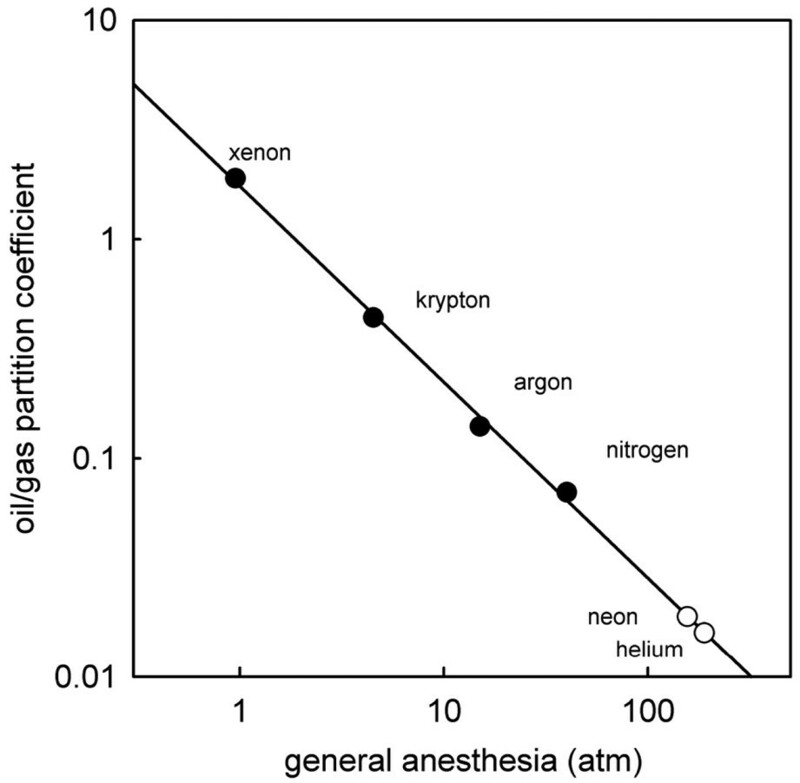 The theoretical pressures for anesthesia are 156 atm for neon and 189 atm for helium. The lighter inert gases neon and helium are not anesthetics [24, 25], at least up to the highest pressures (~100 atm) that can be tolerated before the confounding effects of high-pressure neurological syndrome become pronounced. At these high pressures, the manifestations of high-pressure nervous syndrome include hyperexcitability, tremors and convulsions [26, 27], which would act to oppose any sedative or anesthetic effect. The lack of observable anesthetic effects of helium and neon are either due to a lack of biological activity or, alternatively, these gases could have some intrinsic anesthetic potency at high pressures that is counteracted by the effects of high-pressure nervous syndrome. If we make the assumption that these gases do have some intrinsic potency that would be observable in the absence of the confounding effects of high-pressure nervous syndrome, it is possible to calculate a theoretical anesthetic pressure. Based on the Meyer-Overton correlation and using loss of righting reflex in mice as the anesthetic endpoint, the predicted anesthetic pressures are 156 atm for neon and 189 atm for helium (see Figure 1). Although the general anesthetic properties of xenon have been known since the 1950 s, only recently have molecular targets for xenon been identified that could mediate xenon's biological actions. The first target to be identified was the N-methyl-d-aspartate (NMDA) receptor when, in 1998, it was shown that xenon inhibited NMDA-evoked currents in cultured hippocampal neurons by ~60% at a clinically relevant concentration of 80% xenon . Xenon was also found to inhibit NMDA receptors at glutamatergic hippocampal synapses by ~60%, but to have little effect on synaptic α-amino-3-hydroxy-5-methyl-4-isoxazolepropionic acid (AMPA)/kainate receptors . The specificity of xenon for the NMDA-mediated component of the glutamatergic synaptic response, together with the lack of effect at inhibitory γ-amino-butyric acid (GABA)ergic synapses [28, 29], imply that xenon acts postsynaptically. Another finding consistent with a postsynaptic site of action for xenon is the lack of effect of xenon on N-type voltage-gated calcium channels, which are involved in neurotransmitter release at neuronal synapses . The molecular mechanism by which xenon inhibits the NMDA receptor has now been elucidated . It has been shown that xenon competes for the binding of the co-agonist glycine at the glycine site on the NMDA receptor (Figure 2a). Based on protein crystallographic data, the binding of glycine is proposed to result in domain closure of the NMDA receptor leading to channel opening, and competitive inhibitors are suggested to prevent this domain closure . Xenon therefore possibly stabilizes the open conformation of the domains, thus preventing channel opening. Identified targets for xenon that may mediate xenon anesthesia and neuroprotection. (a) Xenon binds to the N-methyl-D-aspartate (NMDA) receptor at its glycine binding site. (b) Lineweaver-Burk plot showing competitive inhibition of the NMDA receptor by xenon. Inhibition is glycine dependent, with greater inhibition at low glycine concentration (1 μM) (inset upper right) compared with high glycine concentration (100 μM) (inset lower left). (c) The two-pore domain potassium channel TREK-1 is activated by xenon in a concentration-dependent manner. Inset: the current activated by 80% xenon. Horizontal bar, 2-minute application of xenon, the current amplitude is 106 pA. (d) The ATP-sensitive potassium (KATP) channel is activated by xenon. Main figure shows that 80% xenon activates KATP and that the current is abolished by 0.1 mM of the specific blocker tolbutamide (Tb). Inset: percentage activation of the current measured at -20 mV by 50% and 80% xenon. *P < 0.05. Figures adapted from: (a), (b) Dickinson and colleagues , (c) Gruss and colleagues , and (d) Bantel and colleagues . Interestingly, recent crystallographic data on the binding of xenon to the Annexin V protein suggest that xenon may disrupt conformational changes in this protein . Consistent with competitive inhibition at the NMDA-receptor glycine site, xenon inhibits the NMDA receptor more potently at low glycine concentrations than at high glycine concentration (Figure 2b). In addition to competitive inhibition at the glycine site, a Lineweaver-Burk analysis (Figure 2b) shows that xenon has an additional noncompetitive component of inhibition . It is possible that xenon's mixed competitive and noncompetitive inhibition underlies its beneficial profile compared with other NMDA receptor antagonists. It was recently reported that xenon inhibits synaptic AMPA receptors in brain slices from the prefrontal cortex and spinal cord to a similar degree as NMDA receptors  - in contrast to previous studies that found little or no inhibition of AMPA-mediated synaptic responses in hippocampal neurons [28, 29]. The extent to which AMPA receptors are inhibited by xenon remains to be clarified. If xenon does inhibit AMPA receptors, however, this inhibition could contribute to xenon anesthesia and neuroprotection. Unlike most general anesthetics (for example, isoflurane, sevoflurane, propofol, etomidate), xenon has little or no effect on GABAA receptors. In cultured hippocampal neurons and mouse fibroblast cells stably expressing α1β1γ2L subunits, xenon has no effect on currents elicited by exogenous GABA . Similarly, xenon has no effect onGABAergic synapses in cultured hippocampal neurons . A study using Xenopus oocytes expressing α1β2γ2S subunits, however, reported a small (~15%) potentiation of GABA-evoked currents by xenon . Whether this reflects dierences between Xenopus oocytes and mammalian systems or between different GABAA-receptor subunit combinations is not clear. Nevertheless, xenon's effect on GABAA receptors is minimal compared with other anesthetics that typically potentiate GABAergic currents by 100% or more at clinical concentrations [29, 36–39]. The identification of xenon as an inhibitor of the NMDA receptor provided the first putative target for xenon anesthesia and prompted the idea that xenon might be neuroprotective (as glutamate excitotoxicity is involved in pathological conditions such as ischemia and traumatic brain injury [40, 41]). Since then a small number of other targets have been identified that may also play a role in mediating xenon's anesthetic and neuroprotective properties. The two-pore domain potassium channel TREK-1 is activated by xenon  (Figure 2c). Two-pore domain potassium channels modulate neuronal excitability by providing a background or leak potassium conductance. Activation of two-pore domain potassium channels will tend to hyperpolarize the cell membrane and reduce neuronal excitability. Volatile anesthetics such as halothane and isoflurane also activate TREK-1 . Studies using TREK-1 knockout animals have implicated this channel in general anesthesia with volatile anesthetics, and in neuroprotection by the fatty acid linolenate . Whether activation of TREK-1 plays a role in mediating anesthesia and neuroprotection with xenon remains to be determined. Nevertheless, TREK-1 is a plausible target for these actions of xenon. Recently, xenon has been shown to activate another potassium channel, the plasmalemmal ATP-sensitive potassium (KATP) channel . KATP channels are inhibited by physiological levels of ATP and act as sensors of metabolic activity. In neurons, KATP channels are activated under conditions of physiological stress such as hypoxia. Activation of KATP channels reduces neuronal excitability and is protective against ischemic injury . Clinical concentrations of xenon activate KATP channels by up to 50% (Figure 2d), and this activation may mediate xenon preconditioning against ischemic injury . Other ion channels that appear to be sensitive to xenon are neuronal nicotinic acetylcholine (nACh) receptors and 5-hydroxytryptamine type 3 (5-HT3) receptors. Neuronal nACh receptors, composed of α4β2 subunits, and homomeric α7 subunits are inhibited by xenon, whereas α4β4-containing receptors are insensitive to xenon [36, 47]. Although nACh receptors are inhibited by a number of anesthetics at clinically relevant concentrations, it is unclear whether this inhibition has any role in mediating general anesthesia. Neuronal nACh receptors have been implicated in neuroprotection (for a review see ). However, it is activation of nACh receptors that is neuroprotective. Hence, inhibition of nACh receptors by xenon is unlikely to play any role in xenon neuroprotection. Xenon inhibits human 5-HT3 receptors expressed in Xenopus oocytes by ~65% at clinical concentrations . The clinical significance of this observation, however, is unclear. While 5-HT3 antagonists, such as ondansetron, are used as antiemetics, xenon appears if anything to cause more postoperative nausea and vomiting compared with propofol . Xenon was first used as a general anesthetic in the 1950 s by Cullen and coworkers in the United States. They reported successful anesthesia in two patients using 80% xenon, 20% oxygen. One patient was an 81-year-old male undergoing orchidectomy, and the other was a 38- year-old female undergoing ligation of the fallopian tubes . This was followed by use in a further five patientsundergoing hernioplasty . Loss of consciousness occurred when patients breathed 50% xenon, and a xenon concentration of 75 to 80% was used for maintenance of anesthesia during the surgery. Following the definition of minimum alveolar concentration as the standard anesthetic endpoint by Eger and colleagues , the value for xenon was determined. In a study of 28 patients, the minimum alveolar concentration of xenon was found to be 71% . More recent estimates of the xenon minimum alveolar concentration are in the range 63 to 68% [55, 56]. For the next two decades the use of xenon as a general anesthetic remained a curiosity and received little attention. In the 1990 s interest in xenon anesthesia received new impetus as xenon's beneficial clinical properties were further investigated. Lachmann and coworkers found that xenon anesthesia resulted in greater hemodynamic stability compared with nitrous oxide [57, 58]. The same studies showed xenon to be a profound analgesic, as evidenced by a greatly reduced need for fentanyl analgesia during surgery. On average, patients receiving xenon needed only 20% of the dose of fentanyl required when nitrous oxide was used instead of xenon . Similar findings were later reported by Nakata and colleagues . A multi-modal experimental pain study in healthy volunteers reported that the analgesic potency of xenon was 1.5 times that of nitrous oxide . Emergence from xenon anesthesia is rapid, with xenon emergence times being only 50% of the emergence times using nitrous oxide/sevoflurane anesthesia, and the emergence times with xenon are independent of the duration of anesthesia [61, 62]. These properties of rapid induction and emergence arise from xenon's very low blood/gas partition coeffcient of 0.115  and its low solubility in lipids (xenon has an oil/gas partition coeffcient of 1.9; Table 1) compared with other inhalational agents. For example, isoflurane has a blood/gas coeffcient of 1.4 and an oil/gas partition coeffcient of 97, and for sevoflurane these values are 0.69 and 53, respectively . Xenon's properties of cardiovascular stability, rapid onset and emergence from anesthesia, profound analgesia and the fact that xenon is not metabolized are some of the characteristics of an ideal anesthetic. Xenon would be a useful replacement for nitrous oxide, with the advantage that xenon - being a natural component of the atmosphere - is not a greenhouse gas. Nitrous oxide, on the contrary, is chemically synthesized and is 230 times more potent as a greenhouse gas than carbon dioxide . Furthermore, there are concerns regarding the possible toxic effects of nitrous oxide, particularly in pediatric anesthesia (for reviews see [66, 67]). The discovery that xenon is an NMDA-receptor antagonist  led to the idea that xenon may be neuroprotective. The renewed clinical interest in xenon in the past 10 years is due, in large part, to xenon's potential as a neuroprotectant. In 2003 the first multicenter randomized control trial, involving 224 patients in six centers, compared xenon/oxygen with isoflurane/nitrous oxide anesthesia, and concluded that xenon anesthesia is as safe and effective as the isoflurane/nitrous oxide regimen, with the advantage that xenon exhibited more rapid recovery . Another study of 20 patients undergoing coronary artery bypass surgery compared the cardiovascular effects of xenon with nitrous oxide when used to supplement fentanyl-midazolam anesthesia. This study found that xenon provided better hemodynamic stability and preserved left ventricular function better compared with fentanyl-midazolam alone . Studies in both cardiac and noncardiac patients showed that xenon does not impair cardiovascular function and maintains higher arterial pressure compared with propofol [69–71]. A recent multicenter trial of xenon compared with isoflurane found that xenon did not impair left ventricular function while isoflurane significantly decreased global hemodynamic parameters . These clinical data show that xenon is safe and effective as an anesthetic, with some advantages compared with conventional anesthesia regimens. The high cost of xenon and the need for closed-circuit anesthesia with a specialized anesthesia machine, however, will limit xenon's widespread use unless a significant clinical benefit (for example, neuroprotection) can be found. Overactivation of glutamate receptors is involved in a number of pathological processes. Excessive entry of calcium, mediated by NMDA receptors, triggers bio-chemical cascades that ultimately lead to neuronal cell death. This neurotoxicity due to overactivation of NMDA receptors was termed excitotoxicity by Olney , and is believed to underlie the neuronal injury observed in pathological conditions such as stroke and traumatic brain injury. There has, for some time, been evidence that NMDA-receptor antagonists are neuroprotective in in vitro and in vivo brain injury models . Following the discovery that xenon inhibits NMDA receptors, it was shown that xenon could protect neuronal cell cultures against injury induced by NMDA, glutamate or oxygen-glucose deprivation . The same study showed xenon to be neuroprotective in vivo against neuronal injury caused by subcutaneous injection of N-methyl(D, L)-aspartate in rats. Other NMDA-receptor antagonists such as nitrous oxide, ketamine and dizocil-pine (MK801) have intrinsic neurotoxicity, but xenon appears devoid of neurotoxic effects [73, 74]. 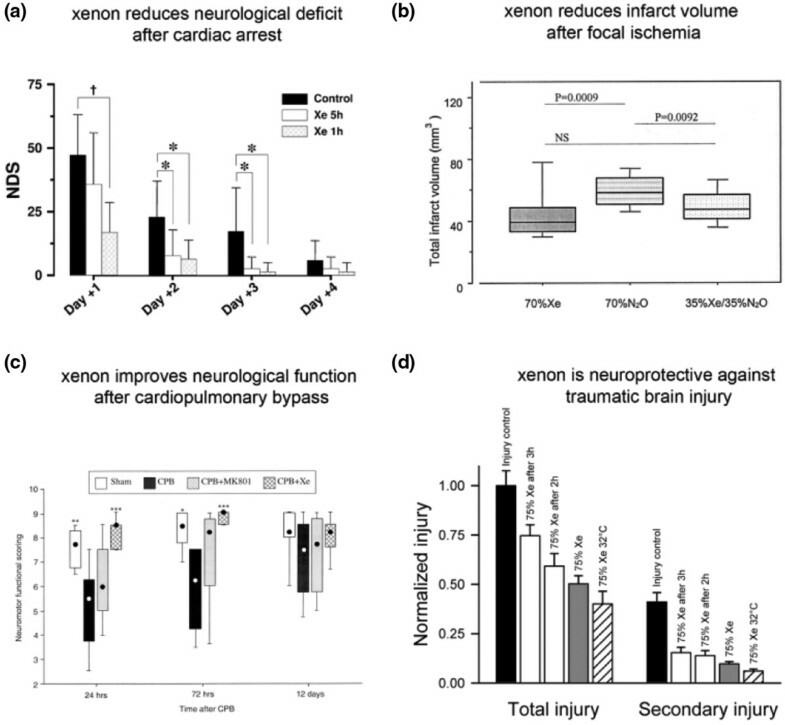 Xenon has now been shown to afford neuroprotection in a variety of mammalian in vitro and in vivo models, including focal cerebral ischemia (mouse), neonatal asphyxia (mouse), neurocognitive deficit following cardiopulmonary bypass (rat and pig) and traumatic brain injury (mouse) [5, 75–81] (Figure 3). Xenon is neuroprotective in a variety of mammalian in vitro and in vivo models. (a) Xenon treatment after cardiopulmonary resuscitation reduces neurological deficit in a pig model. There is a significant improvement in the neurological deficit score (NDS) in xenon-treated animals. †P < 0.01, *P < 0.05. (b) Xenon reduces infarct volume after focal ischemia in mice. Infarct volume after transient middle cerebral artery occlusion is significantly reduced in xenon-treated animals compared with those treated with nitrous oxide. NS, not significant. (c) Xenon improves neurological function following cardiopulmonary bypass (CPB) in a rat model. Xenon-treated animals received 60% xenon during CPB procedure. *P < 0.05, **P < 0.01, ***P < 0.001. (d) Xenon is neuroprotective in an in vitro model of traumatic brain injury. Xenon (75%) give significant neuroprotection (P < 0.05) when applied immediately after the trauma (grey bars) or after a delay of 2 or 3 hours (white bars). Xenon is particularly effective at reducing the secondary injury that develops in the 72 hours following injury. Figures adapted from: (a) Fries and colleagues , (b) Homi and colleagues , (c) Ma and colleagues , and (d) Coburn and colleagues . Inhibition of the NMDA receptor by xenon is plausible as a mechanism for xenon neuroprotection. Only very recently, however, has a direct connection between NMDA-receptor antagonism and xenon neuroprotection been demonstrated. Banks and colleagues  showed that acute xenon neuroprotection in an in vitro model of hypoxia/ischemia can be reversed by elevating the glycine concentration (Figure 4a), consistent with xenon neuroprotection being mediated by inhibition of the NMDA receptor at its glycine site . Interestingly, xenon appears to act synergistically with the neuroprotective effects of both hypothermia and the volatile anesthetic isoflurane [76, 82]. Although a mechanistic explanation for this synergism remains to be determined, isoflurane - in addition to its well-known actions at the GABAA receptor - also competes for glycine at the NMDA-receptor glycine site . The binding of volatile general anesthetics to proteins increases at lower temperatures due to favorable enthalpic interactions, and this increase in binding correlates with the increase in general anesthetic potency observed at lower temperatures [83–85]. Whether xenon exhibits similar temperature dependence in its interactions with the targets mediating its anesthetic and neuroprotective effects remains to be elucidated. Different targets mediate acute xenon neuroprotection and xenon preconditioning. (a) Acute xenon neuroprotection against hypoxia/ischemia involves the N-methyl-D-aspartate-receptor glycine site. Acute xenon protection is reversed by adding glycine. Applying 50% atm xenon after hypoxia/ischemia in the absence of added glycine (black bars) gives robust protection (32 ± 6% of control injury). However, the protective effect of 50% atm xenon is abolished in the presence of 100 μM glycine. 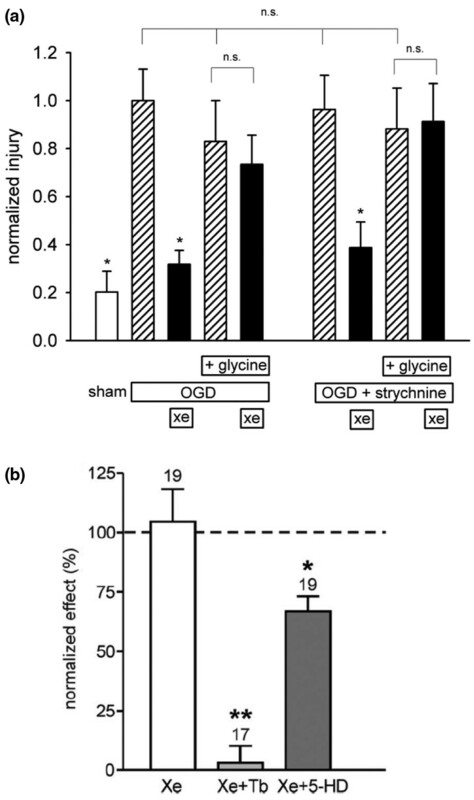 Addition of the inhibitory glycine receptor antagonist strychnine (100 nM) had no effect on control oxygen-glucose deprivation (OGD) with or without glycine, xenon neuroprotection without glycine, or the reversal of xenon neuroprotection by glycine. The error bars are standard errors from an average of 44 slices at each condition. Data have been normalized to the control OGD with no added glycine. *Value significantly different (P < 0.05) from control OGD. n.s., not significant. Figure adapted from Banks and colleagues . (b) Xenon preconditioning against hypoxia/ischemia involves the plasmalemmal ATP-sensitive potassium (KATP) channel. Exposure of cultured neurons to 75% xenon for 2 hours protects cells against hypoxia/ischemia 24 hours later (white bar). This effect is abolished by the plasmalemmal KATP blocker tolbutamide (Tb) (0.1 mM) but not by the mitochondrial KATP channel blocker 5-hydroxy-decanoic acid (5-HD) (0.5 mM). *P < 0.05, **P < 0.01. Figure adapted from Bantel and colleagues . In addition to its action as an acute neuroprotectant (when applied during or after the insult), xenon is neuroprotective in preconditioning paradigms. Preconditioning refers to the situation where a neuroprotectant is present before the insult, but not during or after the insult. Exposure to xenon for 2 hours, prior to hypoxia/ischemia 24 hours later, was shown to result in reduction of injury in cultured neurons and in vivo in neonatal rats [45, 86]. Inhibition of the NMDA receptor might be thought to be less likely to play any role in xenon preconditioning, as pathological glutamate release occurs only during and after the insult. Since NMDA receptors are not overstimulated before the insult, how their inhibition by xenon could mediate xenon preconditioning is not as clear as in the case of acute xenon neuroprotection. Nevertheless, NMDA receptors are known to couple to many intracellular signaling pathways, so it remains possible that xenon inhibition of normal NMDA-receptor functioning before the insult could trigger some long-term effect that might mediate preconditioning. Whether the NMDA receptor plays a role in xenon preconditioning remains to be determined. A recent study, however, has identified the ATP- sensitive potassium KATP channel as being involved in xenon preconditioning. Bantel and colleagues showed that xenon preconditioning against hypoxia/ischemia is abolished by the plasmalemmal KATP channel blocker tolbutamide (see Figure 4b) , implying a role for the activation of the KATP channel. The mechanism by which transient activation of the KATP channel by xenon results in neuroprotection 24 hours later is not known. There is some evidence to suggest that xenon preconditioning results in an increase in phosphorylated cAMP response element binding protein and the pro-survival proteins B-cell lymphoma 2 and brain-derived neurotrophic factor , although a causal link with KATP channels has not been established. The clinical trials discussed previously have looked at the safety and efficacy of xenon as an anesthetic. Very few trials, however, have as yet directly addressed xenon neuroprotection. Clinical trials are underway, or planned, looking specifically at xenon as a neuroprotectant in cardiopulmonary bypass (a procedure associated with postoperative cognitive deficit), neonatal asphyxia and neurological deficit following cardiac arrest and resuscitation. To date, however, none of these trials have been completed. A phase 1 trial in patients undergoing coronary artery graft on cardiopulmonary bypass that showed xenon can be safely delivered to these patients has been completed . Two trials have examined postoperative cognitive deficit (POCD) in elderly patients undergoing noncardiac elective surgery, comparing xenon anesthesia with propofol anesthesia [87, 88]. Neither study found a decreased incidence of POCD in the xenon group compared with the propofol group. Another study looking at POCD in elderly patients undergoing elective surgery found no advantage of xenon compared with desflurane anesthesia . The lack of efficacy in these trials may, partly, be explained by the low numbers of patients resulting in underpowered studies. Only one of the studies involved more than 100 patients , and the other two used fewer than 40 patients each. Another confounding factor is that, although POCD is a recognized phenomenon, particularly in the older person, it is not straightforward to quantify POCD. The different studies used different assessment criteria and different times after surgery when assessments were performed. Larger trials will be required to definitively determine whether xenon reduces POCD in elderly patients. POCD following cardiopulmonary bypass (CPB) is thought to result in part from particulate and gaseous cerebral emboli subsequent to CPB. Concerns have been raised about the potential effects of xenon on gas-embolism growth as xenon may increase the size of preexisting gas emboli, but estimates as to the extent of this effect vary widely in the literature. A theoretical study predicted rapid and infinite expansion of 50 nl air bubbles in the presence of 70% xenon . An experimental study, however, found 50% xenon to have only a relatively modest effect . Both this study and other experimental studies have compared xenon with nitrous oxide, and show that xenon causes much less expansion of gas bubbles than does nitrous oxide [91–93]. Studies in animal models of CPB have reported differing results regarding the effects of xenon on gas emboli. Grocott and colleagues reported a modest (17%) increase in the size of large (~400 nl) air bubbles artificially introduced into a bypass circuit in a rat model in the presence of 70% xenon . Another study using a rat CPB model combined with artificially introduced air bubbles of 300 nl reported that exposure to 56% xenon resulted in increased infarct volume and neurological deficit compared with nitrogen . A later study by the same group, however, concluded that xenon did not affect neurological or histological outcome . The reasons for these discrepancies are not clear. It should be noted that the artificial introduction of a small number of relatively large air bubbles into the CPB circuit does not accurately model the clinical scenario, where it is more likely that bubbles will be small in size but may be numerous. The only human trial that has directly measured embolic load in CPB patients during xenon treatment found that xenon (20 to 50%) caused no increase in embolic load . Nevertheless, the issue of whether xenon may increase embolic load should be borne in mind (and monitored) in future clinical trials. Aside from its potential to reduce POCD, xenon could be argued to be more likely to show a benefit in situations where the potential damage in the absence of any neuroprotection is more severe. In this regard it will be interesting to see whether clinical trials of xenon in neonatal asphyxia show xenon to be neuroprotective, as has been demonstrated in in vivo models of neonatal asphyxia [76, 96]. The evidence for the neuroprotective properties of xenon has prompted interest in investigating whether other inert gases have similar potential as neuroprotectants. Helium is the lightest of the inert gases, is not an anesthetic, is much more abundant and is significantly cheaper to produce than xenon. Mixtures of helium and oxygen (heliox) are used in diving to avoid the effects of nitrogen narcosis. Medical use of helium/oxygen has been advocated in patients with respiratory illness. The first use of helium/oxygen in acute asthma patients was in 1934 , with the study reporting an alleviation of dyspnea. Recent systematic reviews, however, have concluded that the current evidence does not support use of helium/oxygen in acute asthma or chronic obstructive pulmonary disease [98, 99], and helium has not been widely used to treat respiratory illness. To date there have been relatively few studies investigating the potential of helium as a neuroprotectant, and these have been limited to in vitro and in vivo models. In an in vitro organotypic hippocampal brain slice model of traumatic brain injury, mild hyperbaric helium (0.5 or 1 atm) was found to be neuroprotective . This study found that the outcome was significantly worse if nitrogen replaced helium. The authors concluded that the effect of helium was the result of a beneficial effect of pressure per se combined with an attenuation of the deleterious effects of nitrogen . Interestingly, an in vitro model of hypoxic/ischemic injury using the same organotypic brain slice preparation found no effect of 0.5 atm helium . This may reflect the fact that different mechanisms of injury are activated in these different injury paradigms. Another in vitro study using cultured neurons reported that normobaric helium (75%) was actually detrimental to neuronal survival after hypoxia/ischemia . An in vivo study in rats subjected to focal ischemia, however, reported that 75% helium reduced the infarct volume and improved functional neurological outcome 24 hours after injury . The reasons for the diering findings with helium in these studies are not entirely clear. Nevertheless, it is interesting to note that these variable effects with helium contrast with the effects observed with xenon, which appears to be neuroprotective in all of these models. While a number of pharmacological targets have been identified for xenon, no targets have been identified for helium. Helium is considered to be inert and lacking in an intrinsic pharmacological effect; helium is therefore often used as a pressurizing gas in studies of the biological effects of pressure per se [100, 101]. Compared with xenon, which has neuroprotective effects at concentrations similar to those causing anesthesia, it seems implausible that the nonanesthetic helium would have any pharmacological effect at or near atmospheric pressure. Even if we assume, as predicted by the Meyer-Overton correlation, that helium might be anesthetic at ~200 atm (Figure 1), if helium was neuroprotective at 1 atm it would be acting at 1/200th of its anesthetic concentration. Effects at such low relative concentrations have not been observed for other anesthetic neuroprotectants. Even in the case of xenon, which is neuroprotectant at subanesthetic concentrations as low as ~20% , the ratio of neuroprotectant to anesthetic concentration is only ~1/3. Helium therefore seems unlikely to be acting via a pharmacological mechanism. An interesting recent study by David and colleagues, however, has identified a probable physical mechanism that may underlie the reported neuroprotective effects of helium . This study in rats found that, at room temperature, 75% helium resulted in significantly reduced brain infarct size and improved functional neurological outcome when helium treatment took place following middle cerebral artery occlusion. 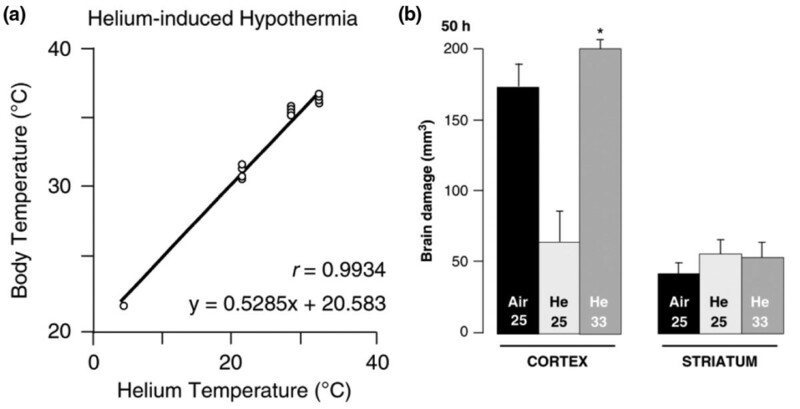 The authors discovered, however, that breathing helium gas below body temperature (for example, 25°C) caused hypothermia in the rats (Figure 5a). Helium was neuroprotective when the inspired temperature was 25°C, but the neuroprotective effect was abolished when the temperature of the inspired helium was increased to 33°C (abolishing the hypothermia) (Figure 5b). The authors conclude that the neuroprotective effects of helium are due to hypothermia. Helium causes hypothermia in rats, which mediates its neuroprotective effect. (a) Breathing 75% helium at temperatures lower than 37°C results in hypothermia. (b) Breathing 75% helium at 25°C following injury protects the cortex against focal ischemic injury (light grey bar). The protective effect of helium is abolished if the gas is warmed to 35°C (dark grey bars). The striatum is resistant to both injury and the protective effects of hypothermia (shown on the right). *P < 0.05. Figures adapted from David and colleagues . Neuroprotection via cooling is well established in model systems and is used clinically (for reviews see [102, 103]). The reason that helium causes hypothermia is due to its high thermal conductivity compared with air. The thermal conductivity of helium is 0.1499 W/m/K - almost six times greater than nitrogen, which has a thermal conductivity of 0.0260 W/m/K (Table 1). Breathing helium at a temperature lower than body temperature will hence cause a reduction in core temperature. This phenomenon is recognized in divers breathing heliox mixtures who require heated diving suits and heated gas delivery equipment in order to avoid hypothermia. Xenon, on the contrary, has a thermal conductivity five times lower than nitrogen (see Table 1), and therefore would not result in cooling via this mechanism. In common with other anesthetics, however, xenon exhibits an anesthesia-induced hypothermia. The neuroprotection observed with helium is probably therefore due to helium-induced hypothermia rather than to any pharmacological effect of helium. The cooling effect of helium could also occur in in vitro systems lacking adequate gas-temperature control, and this may explain the variable effects observed in different studies using helium. The other inert gases - neon, argon and krypton - have received very little attention as potential neuroprotectants. Argon and krypton are anesthetics under hyperbaric conditions, at 15 atm and 4.5 atm, respectively, and might be expected to be neuroprotective at these pressures. It is conceivable that argon and krypton could be neuroprotective at atmospheric pressure - by analogy with xenon, which exhibits neuroprotective properties even at ~1/3 of its anesthetic potency. Neon, on the contrary, is not an anesthetic - but based on its oil solubility, neon might be predicted to be an anesthetic at ~160 atm. By the same argument as above for helium, neon is unlikely to have a pharmacological neuroprotective effect at atmospheric pressures. Neon's thermal conductivity is twice that of nitrogen, hence neon breathing might induce hypothermia. Any effect, however, is likely to be much less than that caused by helium. Argon does appear to be neuroprotective in certain model systems. In an in vivo study, normobaric argon (25 to 77%) increased survival rates of rats exposed to varying degrees of hypoxia . An in vitro study using cochlear organotypic cultures from rats found that argon (74 to 95%) was protective against hypoxic injury and injury induced by the anticancer drug cisplatin or the antibiotic gentamycin . Another in vitro study using mouse cortical cell cultures found that 75% argon protected against hypoxic/ischemic injury but that the same concentrations of krypton or neon had no effect . A recent in vitro study has shown that normobaric argon protects mouse hippocampal organotypic cultures against both ischemic and traumatic injury . Argon therefore does indeed appear to be neuroprotective at normobaric pressures. This effect is most probably mediated by a pharmacological mechanism. The thermal conductivity of argon is less than that of nitrogen - hence argon will not cause hypothermia via this physical mechanism, but may cause anesthesia-induced hypothermia at elevated pressures. The reason for the lack of neuroprotective effect of krypton is unclear. To date, however, there has only been a single in vitro study on krypton. Whether krypton has a neuroprotective effect in other injury paradigms merits further investigation. No molecular targets have as yet been identified that could mediate anesthesia or neuroprotection by argon or krypton. Molecular modeling, however, suggests that the inert gases with anesthetic properties (argon, krypton and xenon) and nitrogen all make similar types of interactions with a model protein cavity . The binding energies of the inert gases can only arise from favorable enthalpic (ΔH) contributions due to London Dispersion forces (also known as van der Waals interactions) and/or charge-induced dipole interactions. Both of these enthalpy terms are proportional to the polarizability (α) of the gas (Table 1). Relative to a particular standard state, the energy of these favorable enthalpic (ΔH) terms must be sufficient to overcome the unfavorable entropy term associated with binding. The anesthetic inert gases (argon, krypton and xenon) can be distinguished from the nonanesthetic helium and neon by their greater polarizability  (Table 1), which results in larger favorable enthalpic interactions. Xenon, for example, has a value of α of 4.04 Å3, which is 19 times greater than that of helium (0.21 Å3) and 10 times that of neon (0.39 Å3). Argon and krypton have α values of 1.64 Å3 and 2.48 Å3, respectively, which are eight times and 12 times greater than the value for helium. Therefore it is plausible that argon and krypton interact with the same targets as xenon, even if somewhat more weakly. That anesthesia and neuroprotection by the inert gases share similar mechanisms is, therefore, an interesting possibility. The present review summarizes studies on the pharmacology and clinical uses of the inert gases as anesthetics and neuroprotectants. Xenon is the only inert gas that is an anesthetic at atmospheric pressure. 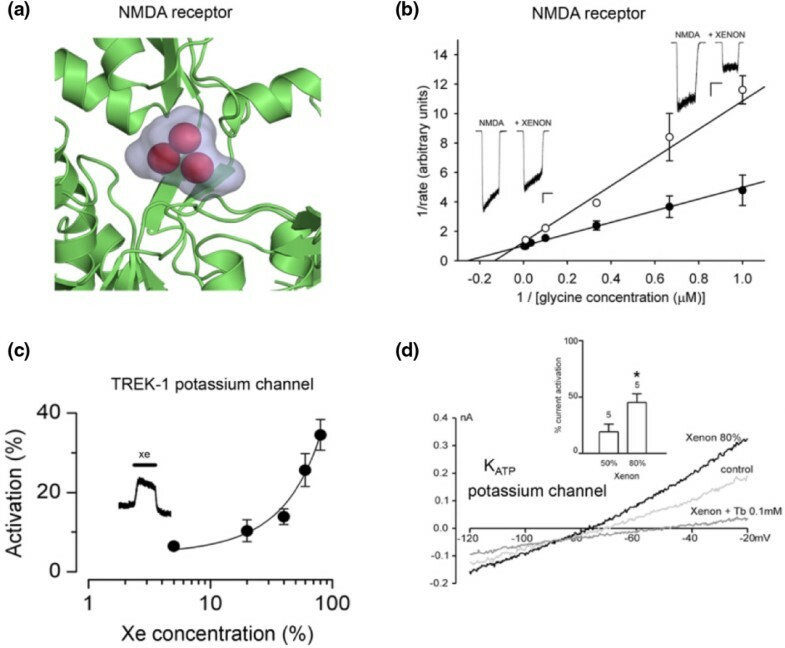 A relatively small number of pharmacological targets for xenon have been identified that may play a role in xenon anesthesia and neuroprotection; the NMDA receptor, the two-pore domain potassium channel TREK-1 and the KATP channel. Xenon has been shown to be an effective neuroprotectant in in vitro and in vivo injury models, and the results of clinical trials to assess xenon's effectiveness as a neuroprotectant in patients are eagerly awaited. The mechanisms involved in xenon neuroprotection are beginning to be understood. There is new evidence that inhibition of the NMDA receptor by xenon mediates acute xenon neuroprotection, and that the KATP channel is involved in xenon preconditioning. Helium has been shown to be neuroprotective in vivo, but this effect is mediated by helium-induced hypothermia rather than by a pharmacological effect. Even if helium is devoid of pharmacological action, the cooling effect resulting from helium's high thermal conductivity could be exploited clinically. Furthermore, as xenon and hypothermia appear to act synergistically in experimental models, it is possible that the two neuroprotective strategies of xenon and hypothermia could be applied simultaneously using a helium/xenon mixture combined with an appropriate controlled gas-cooling apparatus. Argon and krypton are anesthetic at elevated pressures, but few studies have investigated neuroprotection by argon and krypton. However, argon appears to be neuroprotective at atmospheric pressure in certain model systems. Further studies are needed to determine whether argon and krypton have potential as neuroprotectants. The present work was supported by the European Society for Anaesthesiology (Brussels, Belgium), the Royal College of Anaesthetists (London UK), and Westminster Medical School Research Trust (London, UK). NPF has a financial interest in the use of xenon as a neuroprotectant and has been a paid consultant for Air Products and Chemicals Inc. (Allentown, PA, USA) for this activity. RD declares that he has no competing interests.